If you ever spy your wife or husband in discussion with Ayesha Vardag you might need to panic. A glamorous 49-year-old, Ms Vardag is one of the world's most high profile and in-demand divorce lawyers. Nicknamed the "diva of divorce", she specialises in helping "ultra high net worth individuals" get the best possible settlements when their marriages end. Her legal firm Vardags has its headquarters in London, and she has done much to help cement the city's reputation as "the divorce capital of the world". Attracting wealthy clients from around the globe there is often a mad dash between an estranged husband and wife to get to her first. "A separating couple will often genuinely race to get to me to represent them and not the other side," she says. "It really is who gets to me first. We have to do very careful conflict checking." Such is Ms Vardag's reputation for winning that she can charge a small fortune; £795 per hour plus tax. And Vardags, which she started in 12 years ago, now has revenues of more than £10m a year. In the cut and thrust of the legal world, Ms Vardag's success has not been welcomed by all, with critics accusing her of being too interested in self-promotion, such as making appearances on TV and too aggressive in fighting her cases. She counters that she simply recognises the importance of networking, and that some people just don't like a woman who fairly fights her corner. "I'm always extremely courteous with the other side but quite fierce in litigation," she says. "I don't buckle or give up and some people still aren't used to women doing that. "I'm forthright and determined... and I take my space at the table. Some people can find that intimidating, and I do wonder if there is an element of sexism in that." Born in Oxford to an English mother and a Pakistani father, Ms Vardag grew up hardly knowing her dad after he returned to Pakistan when she was a small child. Raised by a single mum, she did well at grammar school, and then studied law at Cambridge University. A career working in financial and commercial law in the City of London followed, until in 2000 her own "not amicable divorce" made her want to switch to family law, and specifically handling divorce cases. She says: "My own divorce lawyer hired me. While I found financial law intellectually very interesting, very few people directly cared about what you were doing. "By contrast, while I found family law just as thrilling there was also a burning imperative to it. You were fighting for people to keep their homes or their businesses or to stay in contact with their kids; such fundamental things." After working for other firms and lecturing in family law at Queen Mary University of London, in 2005 she decided to take leap of faith and launch her own legal practice from her spare room. With no clients to begin with and three children to support, Ms Vardag decided to "network like mad" to get herself known. So, while attending society events across London such as charity balls or exhibition openings, she would introduce herself to people. Her first client, however, was a fellow mum on the school run she got chatting to at a parent-teacher association evening, for whom she secured a good settlement. Other clients then followed as Ms Vardag's reputation grew. She says: "It sounds silly, but when I started the firm there were two things that I looked to for motivation; the Gwen Stefani song 'What You Waiting For', and the Kevin Costner film Field of Dreams, with its mantra 'if you build it they will come'. "It was all about me making the leap of faith." Today Vardags has 55 lawyers in five offices - London, Cambridge, Newcastle, Winchester and Manchester. While all the firm's cases are heard in English (or Welsh) courts, Ms Vardag has for the past two years been based in Dubai. This again is for networking reasons, so she can meet potential future clients from across the Middle East. Although she won't discuss individual cases, you only have to Google her name to read streams of newspaper coverage of her most high profile clients. In one case earlier this year, Ms Vardag helped former Malaysian beauty queen Pauline Chai win a cool £64m. Meanwhile, back in 2009, she successfully argued that the prenuptial agreement that a client, a German heiress, had signed with her husband should be taken into account. It was the first time that a UK court had recognised a "prenup". 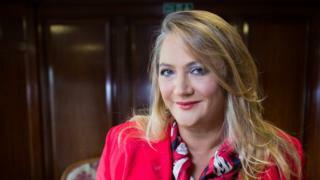 Fellow UK divorce lawyer Vanessa Lloyd Platt says that Ms Vardag has "had a very meteoric rise and I personally like her very much. "I know that some people find her aggressive or whatever but there is so much jealousy within the profession for anyone - and particularly a woman - who has done really well. "I have lots of admiration for what she has achieved, and good luck to her." Ms Vardag says that her involvement in the firm's cases can vary from just offering advice to taking a leading role. She says that clients pay for her to take charge because she can "fundamentally change the outcome and result of the case", and that she can "make a difference worth tens of millions". "You can use the word 'diva' as an insult but I see it as a compliment. It it about being forthright and determined, colourful and flamboyant." Follow The Boss series editor Will Smale on Twitter.